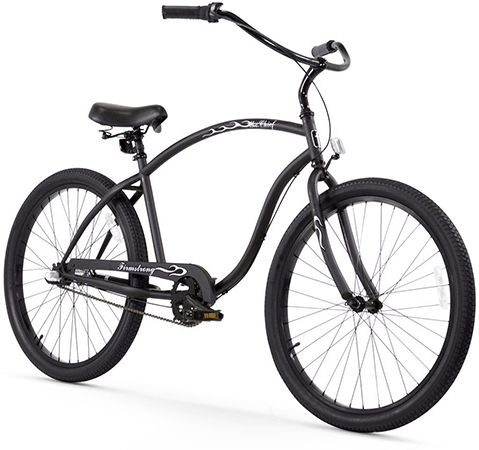 Cruiser bikes not only look cool but also feel great to ride and are cheaper compared to racing and mountain bikes. True to their name, the bikes are designed for beach cruises. To this end, they sport wide tires, thickly padded seats, old school brake system, upright frames and a couple of other features that make them more comfortable than other bikes and add to their elegance. 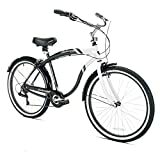 Offered with high tensile steel to last longer, the Diamondback comes with all great features that make a cruiser bike. First off, it sports coaster brakes flip-flop compatible pedals system for comfort while riding. Its top tank tube design coupled with rear fender and chain guard to protect the chain from grit and other substances that may spoil it, make this bike complete. This is a green, 26-inch tire size bike. 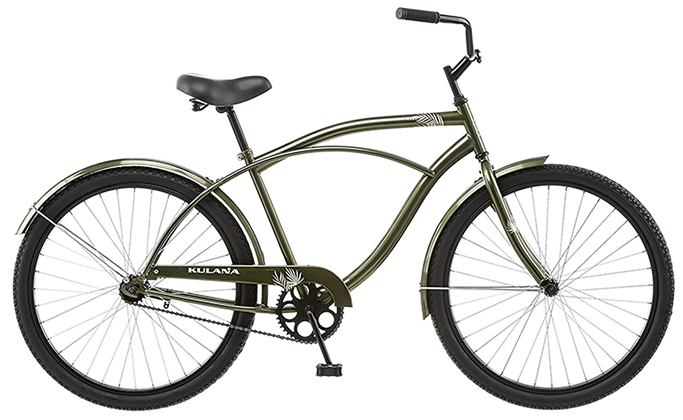 The Kulana is a standard cruiser bike designed for not only beach cruises but also street rides and exercise. 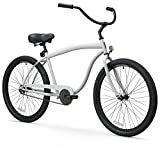 It comes with a steel frame and fork to enhance its durability, an extra-large and thickly padded seat for comfort, full wrap fenders made of steel and easy reach cruise handlebars. The bike sports 26-inch wheels ideal for tall people. It is green. The Kent Oakwood is one among the recent cruise bikes that features aluminum frame; this makes the bike light in weight while ensuring its durability. 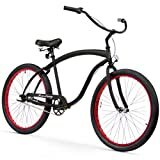 This bike was created for the beach as well as street cruises and is a good choice for a work bike. It is a 7-speed bike with classic rear and front handbrakes, a chain cover and a quick release post clamp seat. 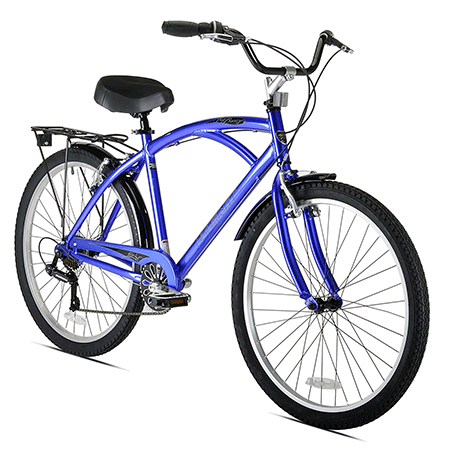 Designed for shopping and street cruises, the Kent Bay Breeze features a rear shopping rack and linear pull handbrakes that enable the rider to stop anytime. It is a seven-speed bike with Shimano gearing that sports twist shifters. A wheel size of 26 inches makes this bike ideal for people of tall stature while its thickly padded seat offer comfort during a cruise. The bike is offered in a purple color with rear and front fenders. Firmstrong was created for tall men; its elongated design gives enough leg room for men up to six feet four tall. It is ideal for commuting, exercise, and recreation. The Firmstrong Bruiser was designed for tall men. 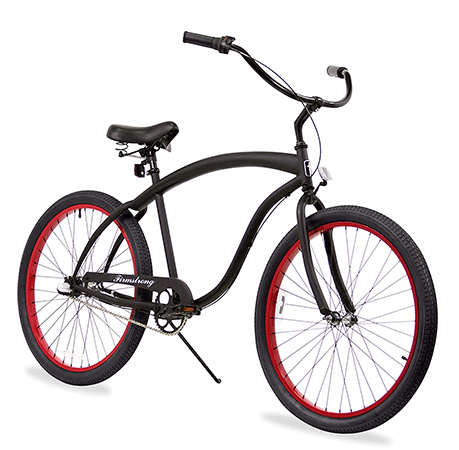 Single speed, 3-speed and 7-speed bikes are available with coaster brakes or front and rear handbrakes. 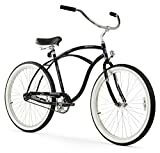 A product of Kent International, North Woods Pomona is a 26-inch beach cruiser bike designed to accommodate tall men and ideal for commuting and exercise. 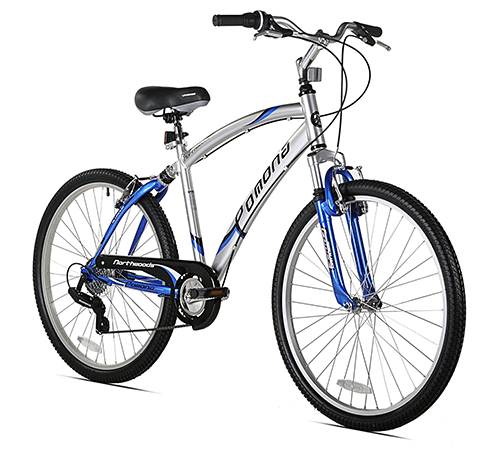 The bike features an aluminum frame, stainless steel handlebars with twist shifters, a padded seat with springs and rear Shimano gears. It is a standard cruiser bike with all basic features to offer comfort and fun. 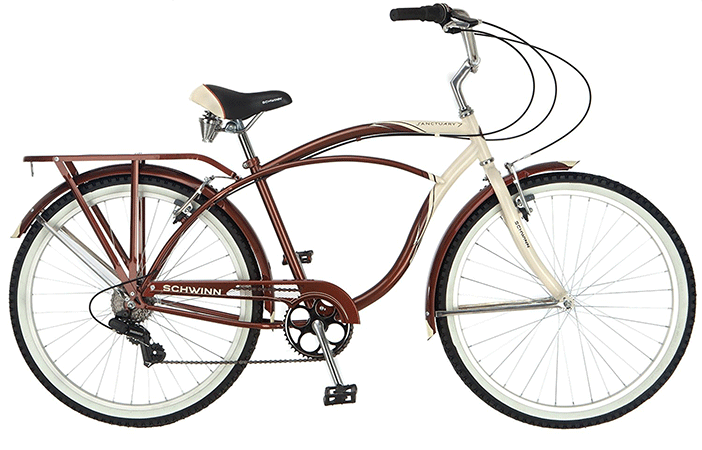 Designed to offer leisurely cruises in the neighborhood, to the store or at the beach, the Shwinn Sanctuary features Shwinn steel frame and fork, rear shopping rack, full fenders to keep the rider protected in the rain and a thickly padded seat for comfort. It also features a 7-speed shimano derailleur with twist shifters for a quick speed change. The alloy rim is lightweight and durable while the cruiser saddle is strong and with springs. Available in 1-speed, 3-speed and 7-speed dellaileur options, In-The-Barrel combines elegance and comfort to offer all a biker needs. 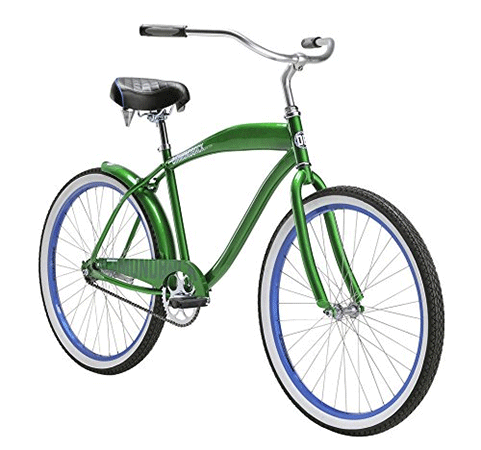 It features a thick top tube, cushy saddles, and comfortable grips. The Sixthreezero is a 26-inch bike with an extended frame for guys who are tall. The bike’s low profile and Nexus gear shifter make it comfortable to ride. The Urban Man comes in two sizes; 24-inch for men between 4 and 5 feet and 26-inch for men between 5 and 6 feet. Buyers can choose between single-speed, 3-speed, and 7-speed gear systems. The 7-speed bike features Shimano internal shifting gear system. Single and three-speed bikes feature coaster brakes while the seven-speed bike comes with front and rear handbrakes. The faux leather grips and large seat with springs add to the comfort of this bike. When choosing a cruiser bike, the most important factor to consider is size; all other aspects of a cruiser bike are the same. There are four sizes to choose from; buyers choose based on their height. Features such as handlebars, saddles, frame, seat, and wheels are the same across different bike brands. However, you need to also consider the comfort of the bike’s seat, the durability of materials and added features such as shopping baskets and gears. Once you have chosen the right size, everything else will depend on your preferences. Beach Cruiser bikes come in different colors, different prices, different materials and different builds. Nevertheless, all are created for comfort and elegance. The round-up of top ten bikes above shows bikes that are high quality in a number of aspects; choosing the right fit for you from the list above will depend more on your budget and your taste.